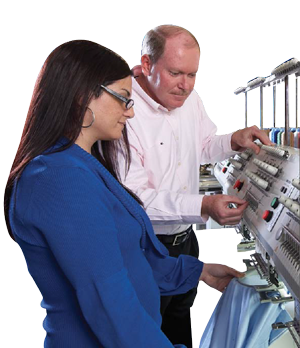 The future of EmbroidMe is now. In January 2017, we announced that the next evolution of our brand. Over the years, customers have asked our stores to provide more products and services to help their business grow and to get more customers. From custom apparel and promotional products to printing services and digital marketing. Following the lead of our successful business owners and their customers, we changed our name to Fully Promoted, Branded Products & Marketing Services. Fully Promoted is now a one stop destination for small and medium size businesses. Our stores provide not only the products and service, but the solutions and ideas to help their customers get more customers. The questions our owners and their employees ask every day is, "Are you Fully Promoted?". In the $50 billion promotional marketing industry, it takes a lot to come out on top. But Fully Promoted and our sister brand, Signarama, are proud to sit right in that sweet spot. For entrepreneurs who want to make an impact through customized marketing solutions, there is really no better opportunity than Fully Promoted. Consistently ranking among Entrepreneur Magazine's Top Franchises to Own, Fully Promoted has a proven track record of success. In fact, Fully Promoted ranked #1 in its category in The Entrepreneur 500 for 2015. With nearly 350 stores across the globe, Fully Promoted is a proven business model. Our B2B paradigm affords owners the opportunity to develop repeat business relationships with volume-based clients while selling a product with a high perceived value. Coupled with our private online stores to further streamline ordering, this model maximizes earning potential with minimal overhead. We ensure that you are knowledgeable and ready to serve your community. You'll take part in one of the most extensive training programs in the franchise industry, which includes 2 weeks of training at our global headquarters in West Palm Beach, Florida. After that, you'll get personal one-on-one training right in your store to ensure you have the technical, business and marketing expertise you need. Ongoing training opportunities are also provided through regional meetings, Fully Promoted brand conventions, United Franchise Group's Leadership Summit and our proprietary online educational portal. With products ranging from marketing material and tradeshow booths to decorated apparel and team uniforms, Fully Promoted is a robust promotional marketing franchise that supports a strong customer base in any economic condition. As an Fully Promoted franchisee, you can expect to pay approximately $174,000 to $178,000 in investment costs, which includes the $49,500 franchise fee, supplies and equipment, insurance, and other operational expenses. If you've ever considered starting a promotional marketing business but didn't know where to start, Fully Promoted is your first step to making your dream a reality.